The face is the most recognizable feature in humans; if it does not develop normally there may be physical and emotional consequences. 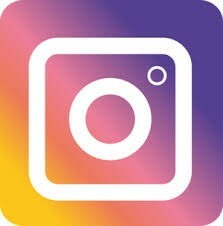 Isolated orofacial clefts (OFCs), primarily cleft lip and cleft palate, are among the most common of all human structural birth defects, and they are the most common craniofacial birth defect, affecting approximately 1 in 700 newborns. Individuals affected by OFCs face feeding difficulties as infants and require multiple surgeries, dental procedures and speech therapy throughout infancy and into early adulthood. On average a child with an OFC undergoes 6 surgeries, spends 30 days in hospital, receives 5 years of orthodontic treatment and requires ongoing speech therapy; this results in an estimated lifetime cost of $200,000. Moreover, each procedure has inherent risks and impacts the child’s psyche, putting social, educational and economic strain on both the child and family. Indeed, individuals born with OFC have an increased incidence of mental health problems, higher mortality rates at all stages of life and higher risk for other disorders – notably breast, brain, and colon cancers. In addition, rates of infant mortality are higher when access to medical care is limited. 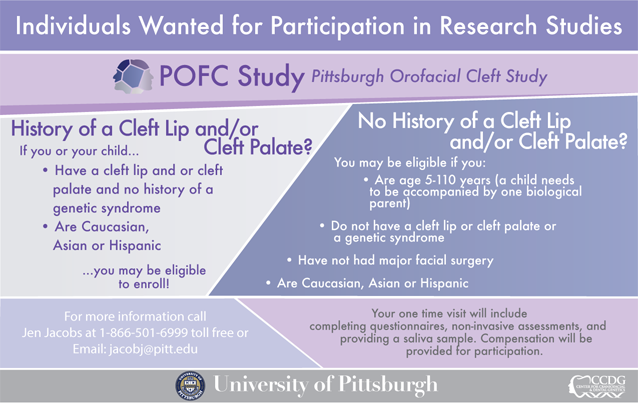 The Pittsburgh Orofacial Cleft Study (POFC) is dedicated to understanding the causes of these common birth defects by investigating genetic contributions to orofacial clefting—with an emphasis on related sub-clinical phenotypes—in families from multiple national and international sites. R03-DE026469 "Analysis of Whole Genome Sequence Data in Orofacial Clefts"
We currently are recruiting new participants for our POFC Study - if interested, please see our flyer below.